The VWR Microplate Shaker is built out of durable cast aluminum and can hold up to four microplates at once. These plate shakers can accommodate everyday lab environments such as cold rooms (-14° to 140°F) and CO2 incubators with 80% non-condensing humidity. The microplates of this lab shaker are secured to the platform using retaining springs. The digital controls of this microplate shaker are situated in the front of the microplate shaker and feature a slow ramping speed to safely achieve desired set point. End users can easily set the timer to a desired number or use a countdown to zero feature after which this robust microplate shaker will shut itself off. The VWR microplate shaker is ideal for immunoassays and general shaking, and can accommodate standard microplates, deep well blocks. Each VWR Microplate Shaker comes equipped with a maintenance free, triple eccentric, brushless DC motor with permanently lubricated ball bearings. This microprocessor controlled microplate shaker has a 3mm orbit size and a speed range of 100 - 1200 RPM. Unit has been tested multiple times by our service department and meets the manufacturer’s listed specifications. The instrument comes with an audible alarm to let you know when your runs are done. 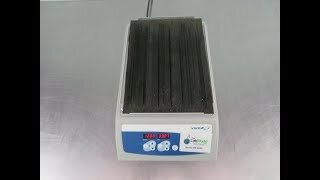 This VWR Microplate Shakers have been thoroughly inspected and performed to expectations. All of our lab equipment comes backed with our standard warranty. Should you have any questions, please don't hesitate to contact us.